Offering you a complete choice of products which include ice cube maker ic-50, ice cube maker ic-100, ice cube maker ic-250, ice cube maker ic-500 and ice cube making machine. Modish Condensed and Distinctive design with low power consumption and water usage. The six sided cube provides large contact surface for fast beverage cooling and ease of handling. Stainless steel interior and exterior for durability and complete resistance towards corrosion. Residuals are drained out after every freezing cycle. A premium all in one platform to perform fusion ice creams and a variety of customized sundaes. Cold Stone as well as Gold Plate available depending on the choice of desserts to be crafted. Multiple bowl rack to offer a variety of toppings. Separately refrigerated and controlled storage cabinet beneath the counter. Separately refrigerated topping bowls for fresh fruits and perishable toppings. We are offering Ice Cube Maker IC-100 to our clients. We are offering Ice Cube Maker IC-250 to our clients. We are offering Ice Cube Maker IC-500 to our clients. 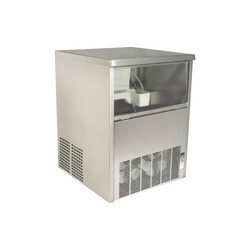 We are recognized as an affluent entity, engaged in offering a wide assortment of Ice Cube Making Machine. It is manufactured using superior quality materials and sophisticated technology in accordance with set industrial standards. In order to ensure its flawless operations, this is also stringently tested on diverse quality parameters. Further, this ice cube maker is ideal for providing cool bedding for foods, fish, and gourmet delicacies. Vertical Evaporator in Dice Cube Machine: Virtually Zero maintenance because there are very few moving parts. Space Saving Design: Easily fits in small spaces. Occupies less floor area than other design. Power saving: Consumes less power than other designs. Hence cost saving. Construction of storage bins: High-density put insulation. Soft Polymer for better insulation and noise reduction.